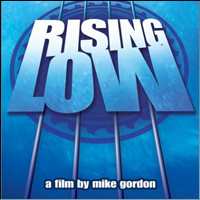 RISING LOW documents what happened when 25 bass players as diverse as John Entwistle (The Who) and Larry Graham (Sly & The Family Stone) came together to record with Gov't Mule, a power trio fronted by guitarist Warren Haynes (The Allman Brothers Band). The trio suffered a devastating loss when their bassist, Allen Woody, died in August 2000. Knowing that no single person could fill this void, the band decided to feature a different bass player on each song of their new recording project, The Deep End. Warren's friend Mike Gordon, filmmaker (Outside Out) and bassist for the band Phish, was invited to document the recording sessions. As a featured guest on the album, Mike offers an inside perspective on this historic summit of bass players. Through interviews and "experiments," Mike goes beyond the story of Allen Woody to explore why musicians rise to the top of their field, and the role of groove and deep vibration in bass playing. With many of world's greatest bass players gathered to record with Gov't Mule, Mike had an intimate setting in which to address these themes.